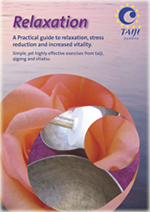 Some time ago Nils Klug and I as part of our Taiji Europa project created a special dvd on the theme of relaxation. Simply entitled “Relaxation” the DVD features 8 of Europe’s key instructors proving simple, yet highly practical exercises designed to relax the body, calm the mind and stimulate the body’s natural healing energies. The DVD includes Nabil Ranné, Ronnie Robinson, Cornelia Gruber, Wilhelm Mertens among others.